How GISS creates long term Antarctic warming | Watts Up With That? From Tallblokes Talkshop, note what happens before 1958. 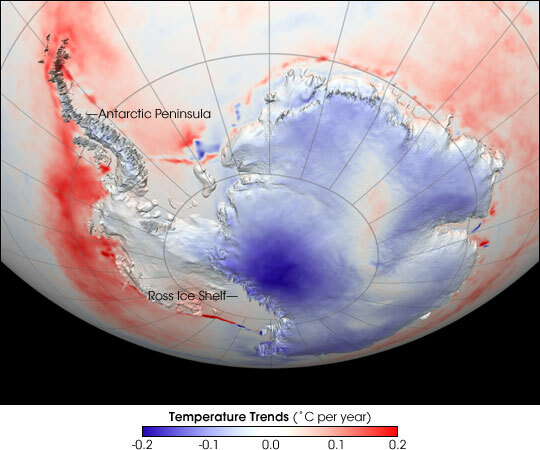 The 1945-55 temperatures come entirely from stations on and around the Antarctic Peninsula that show much more warming than the mainland stations over the period of common record after 1955, and the 1904-44 temperatures come from a single station – Base Orcadas in the South Orkneys northeast of the Antarctic Peninsula. Projecting temperatures from the Antarctic Peninsula over the entire the entire 64-90S latitude zone, which covers an area of 25 million square kilometers, is bad enough, and projecting temperatures from a single record like Base Orcadas over a zone this large is even worse. But it gets worse yet. The map below shows where Base Orcadas is. 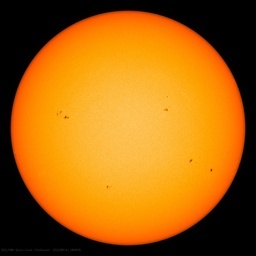 At 60 degrees 44 minutes south latitude IT ISN’T EVEN IN the 64-90S latitude zone. It’s in the next GISS latitude zone up – the 44-64S zone. It’s hard to see how data manipulation in the service of global warming could get much more creative than that. Would have tought Orcadas would give a warmer past series, thus messing up their upward trend. Wait – let me guess – they work some kind of adjustment on the data to add value & reduce it a lot? I see the vertical axis is “Temperature Anomaly”, what’s the real temperature? Surely Base Orcadas will be much warmer, being surrounded by sea. This is clearly fraud, writ large. Who is responsible? Ohhh, GISS, that explains a lot…..
Full kudoes to Tallbloke and his correspondents. This is simply appalling, but what else do we expect from our scientific betters….. Surely, these people should be held to account for rewriting the historical record. This GISS mob are clever little vegemites, this cunning graft of temperature series is like grafting an orange on to a palm and making it a tropical fruit. Do they not understand or realise that outside their cloistered paradise of public money, others actually think and observe. I do hope some one in America asks them to clarify this rather odd mismatch and ask them for what reason they could possibly have for such blatant fudging. This is not science, but a deliberate attempt to prove some thing that is not occurring. Shame on them. I notice there isn’t much slope to any of the three series in themselves. The trend only appears when you plot all three together and could well be due to differences in the mean lines of each series. All that can be deduced from the top graph with any degree of confidence is that there has been no significant change in Antarctic temperature since measurements began in 1958. They could have got an even bigger anomaly by using a station in Cape Town. I expect that GISS did not expect anyone to check. Since sea ice in the Antarctic has increased I would expect a definite negative temperature anomaly. I expect your eyes will now be concentrated on GISS claims like never before. 60 deg 44 mins south? To put that in perspective, 60deg 44 mins North goes through the most northerly part of the UK – the Shetland Islands. Its south of Anchorage Alaska, just north of Stockholm Sweden, passing through Helsinki Finland, slightly north of St Petersburg Russia, and quite a bit south of Iceland, which is entirely outside the Arctic circle (just). Best not to check on Base Orcadas temperatures with Weather Underground. The recent info is at Intellicast, and it’s relatively warm, the lowest low of the past two weeks was on October 9 at 32°F, barely freezing. But WU says the station is not responding, and the “History and Almanac” section says the temperature yesterday was 1830°F (999°C). Wow, that’d be a lot of global warming. And by the GISS 1200km temperature smearing technique, clear evidence the warming is now so bad that Antarctica must be melting and the continent is losing land ice. What greater proof would you need? There is a range of 4 deg C prior to 1955 and since then the range is only 2 deg C. It sure looks like increasing CO2 is dampening variability and bringing much more stable conditions to Antarctica or then again maybe the data series really is crap. Thanks for highlighting Roger Andrew’s Talkshop post here Anthony. The article merits the wide dissemination WUWT is able to give it. David M, remember it’s all based on anomalies. I wonder if he’ll come here to justify this manipulation and falsehood of GISS. Thrown in a spreadsheet, by the Annual Average numbers, from 1903 to 2011 (entire record) the warming trend was 0.206°C/decade. But for the past 16 years, 1996-2011, trend was 0.322°C/decade. Guess Orcadas didn’t get the “Pause” memo. Someone please check with Bob Tisdale what the surrounding sea surface temperatures were, if they had that much rise. As it is, I’m suspecting the normal AHHI effect (Antarctica Habitation Heat Island). That kind of extrapolation from far away is even extra invalid in the case of Antarctica. Antarctica is a special situation where the ice is so pure as to be whiter than clouds. High-albedo shading, reflective clouds, ordinarily cooling, instead warm Antarctica. A reduction in cloud cover which would relatively warm other landmasses or the ocean can instead cool Antarctica. The reason for the sharpness of the difference? Temperature trends in Antarctica, like temperature trends elsewhere and “global warming,” are caused in large part by changes in average cloud cover (influenced by changes in cosmic ray flux, in turn driven by variation in solar activity and the interplanetary magnetic field which deflects many GCRs). As seen by comparison of the preceding with the plot at http://tallbloke.files.wordpress.com/2012/10/antarctica_temp_trends4.png?w=614 , Base Orcadas is right out way in the ocean (on a tiny island) where it would show warming during the 1982 to 2004 period despite Antarctica as a whole cooling during that period. Likewise, what temperature change Base Orcadas showed over the 1904 to 1944 period would be utterly different than the temperature change in Antarctica meanwhile. As one sees if comparing to global average temperatures (Loethle 2007 reconstruction) meanwhile, as shown as one of the plots within http://s8.postimage.org/nz4ionvit/suntemp0.jpg (click to enlarge), Antarctic temperature trends over the decades and centuries very much differ from elsewhere. Antarctic ice temperature trends are nothing like those of Base Orcadas on an island way out out in the ocean of different surrounding albedo. It would appear that GISS is using the”Splice-O-Matic” tool (by Ronco) to put dissimilar records together. One wonders where they have hidden all those tempts/studies that demonstrated a forested and animal populated Antarctic ? How could there possibly be any “unprecendented warming” when the place was once the stomping grounds of dinosaurs up to their eyeballs in greenery. So they’re at least good for spreading on sandwiches? GISS likes to spread around the taxpayer “bread”, usually among themselves. Instead taxpayers should be spreading GISS on bread? What a Revolutionary concept! It’s actually two spliced records, neither of which show any warming until you put them together. Worth reading the comments on Tallbloke’s site. Such kind of record extension does not necessarily have to be wrong. If there is a good correlation between overlapping parts of these records, fill-in based on this correlation may be pretty close to reality. Main problem of the graph is, I believe, absence of error bars corresponing to realistic uncertainity of the record. I remember you and Leif having a go at each other some time ago about the influence of the planets, if I am not mistaken? Do you still think that it is the pull of the planets causes my observed weather cycle? Started in 1904. Were the instruments accurate back then? How old was the measuring instruments when installed? It looks as if GISS threw in a huge correction for a more northerly location of Base O. This methodology is safer and saves time and resources. The northern equivalent, would get Arctic temperatures by simply setting thermometers in northern Scotland or southern Norway. here’s the skinny on Base Orcadas from another talkshop contributor. Check these plots! Thanks for an interesting topic. Feel free to use this graphs if they are of any interest. And yet that’s par for the course in AGW land. In my view there is no single sine wave solution. And please remember that the first IPCC Report (AR1) projected greatest warming in the Arctic and the Antarctic because those regions have little atmospheric water vapour to mask warming effects of increasing CO2. Figure 5.4 in the AR1 shows projections of surface air temperature (ten year means) due to doubling CO2 for winter (December, January & February) and for summer months (June, July & August) provided by three climate models. UKHI: 2 to 6 deg.C rise. UKHI: 2 to between 8 and 12 deg.C rise. providing a very conservative estimate of annual rise of 6 deg.C in Antarctica for a doubling of atmospheric CO2. 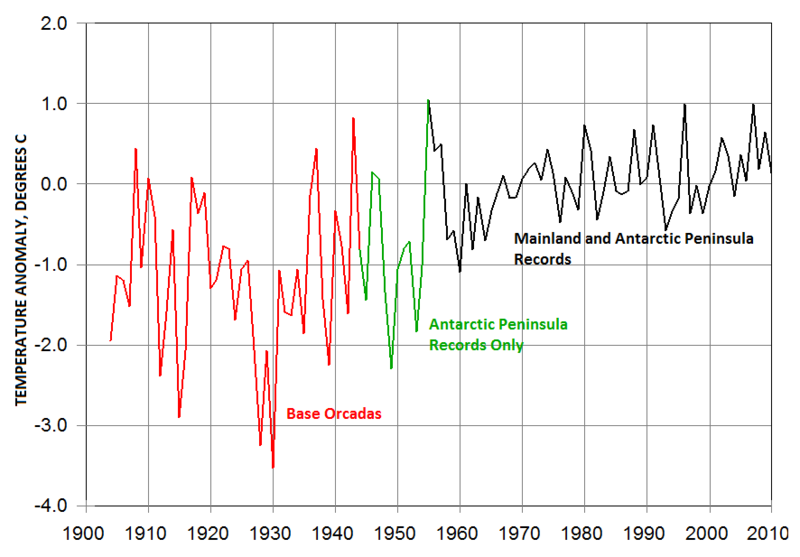 Antarctic temperature should have increased by more than 1 deg.C since 1958. The observed trend is less than a third of the projection. This is like using one weather station in Bermuda to establish the historic temperature record for all of North America. What if warming is coming from the sun? Is that possible? Surely someone has since compared the records to see how these three sources compare? Do Orcadas and A Peninsula track the polar region temps? That would give at least some idea of the justification for the record. Wonder how the farmers here in NE Oregon would like it if they were told to expect temperatures and precipitation based on Newport Beach’s sensor on the Pacific Coast? Or maybe even a sensor perched on an atoll half way to Hawaii? Based on these temperature series we should be able to develop a bananna plantation, or at least grow cranberries, yes? Come on Hansen, have you no practical knowledge whatsoever? true there could be a few more, but I think this one is the more important one, causing a clear weather cycle, more wet during cooling and more dry during warming. Where do you you think the blue line (actual measured) must go but further down south? The fit I finally chose is in fact the most modest one giving me the lowest possible rate of cooling. If I use any other fit I get much higher cooling rates. Remember that the total warming/cooling rate over the whole of this 88 year cycle is 0.0 K per year…. with the dates of the level of Nile flooding is stunning. I thought you would be interested as W.Arnold thought that that 100 year weather cycle must be related to the movement of the planets. They should rename GISS to GIGO. As someone who lives at 60 N, I’m happy to report that the temperature across the Arctic today is a balmy 4,5 deg C.
which various warmists like to use. They should rename GISS to MIGO (i.e. Money In, Garbage Out). My grandmother taught me that a man with one watch has a good idea of what time it is, and a man with two watches is never sure what time it is. Now I think we can add that a man with three watches can claim it is whatever time he wants it to be. Something to ponder: This is really just more evidence that the temperature reconstruction too unreliable to be usable prior to 1950. Unfortunately, this is the period that paleoclimate people are forced to use for their “calibration period” (due to the divergence problem post 1960). I personally don’t have a problem with starting any analysis in 1950. If it gives the ‘wrong’ answer, then bin it to avoid accusations of fraud or denialism. Its very much like a policeman (or woman) collecting evidence for a murder when he (or she) already knows who done it. Its ok to fix the evidence to make sure you get the right man (…or woman). 6 years jail sentence each for the Italian scientists who failed to predict the earthquake. Thank you everyone for you comments. I’ll respond as time permits. This graph shows that there are in fact two temperature records in the South Orkneys – Laurie Island and Louise Island, which is something I didn’t know when I wrote the post. Laurie Island, which shows warming, is the one that GISS and just about everyone else uses as “Base Orcadas”. Louise Island, which doesn’t show warming, appears as “Base Orcadas” only in the KNMI “adjusted” GHCN data base, I suspect by mistake. 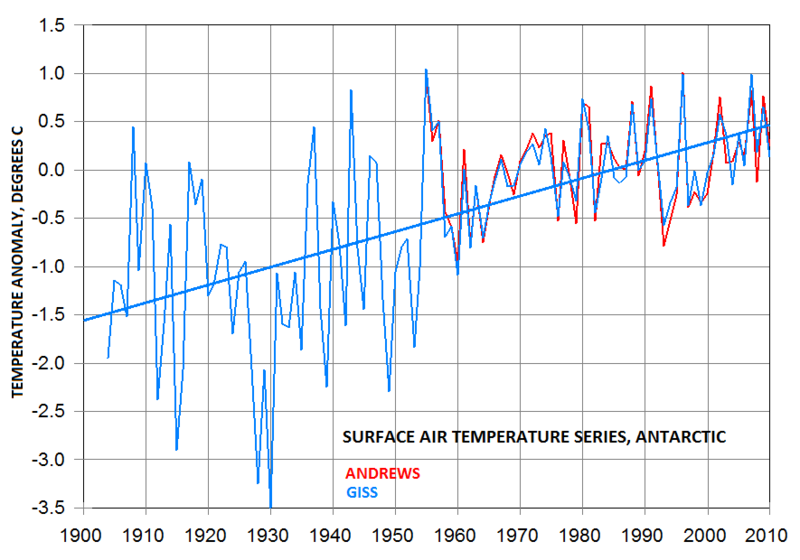 Another graph posted by Tallbloke in an earlier comment further shows that the Laurie Island record, the one that GISS uses, contains a large artificial discontinuity in 1951 that adds maybe 1.5C of overall warming. Here’s how the Laurie Island and Louise Island records compare when this discontinuity is removed. Not perfect, but I think good enough to show a) that the Laurie Island record is indeed warming-biased and b) that there’s been no significant warming in the South Orkneys since 1900. 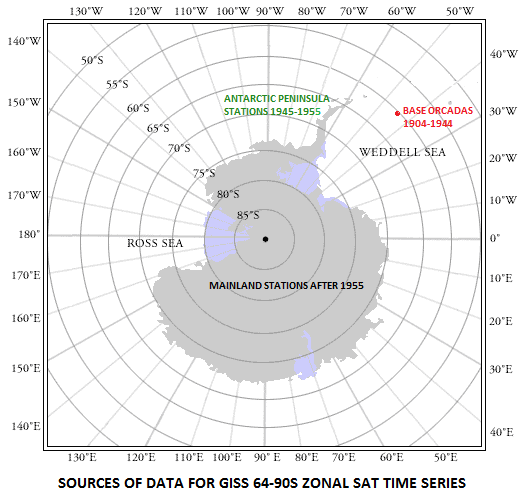 So it seems that not only did GISS base all of its Antarctic series before 1945 on a demonstrably contaminated record from a station located miles outside the Antarctic, it also ignored an uncontaminated record sitting right next door. It’s outrageous really. did they really think no-one would rumble their stupid warming tricks? But they’re all teleconnected, aren’t they? I’m guessing that Base Orcadas, judging by it’s latitude, was so cold from 1904-44 because of the expansion of the antarctic polar vortex due to the ozone hole, which we’re told today is the only way the sub-arctic regions of Antarctica cool in the face of global warming. Lets discuss it on a more appropriate thread. Call by on the De Vries cycle thread at my place if you like. b) that there’s been no significant warming in the South Orkneys since 1900. Remember that the total warming/cooling rate over the whole of this 88 year cycle (plus some lag years either way) is 0.0 K per year…. In the old days on remote stations they used a simple method to establish the mean: take the max and the min for the day and divide by 2. I am asking how you can compare those results with current results where measurements are taken every second and recorded and a mean is calculated for the day? Better to keep looking at maxima only, it will give you most of what you are looking for..
I’ve updated the Talkshop post with this comment and put the graphs inline. My new name could easily be JosteERRmik. Louise Island is located on the Antarctic Penninsula, and that’s the funny part. Not so funny is that the Louise part of the explanation on the data from KNMI Climate Explorer wasn’t ment to be typed. I have never heard of the Louise Island before, and can’t explain what happened. I’m sorry for my mistake, and I can assure you I only intended to show the difference between the two versions of GHCN (adjusted) data v2/v3. I’ll correct the graphs in my next post. Can anyone arrange a Climate Team conference in Italy for Ben Santer, Mike Mann, James Hansen, Lubchenko, et al. If Louise Island is on the Antarctic Peninsula and not on South Orkney I guess I’d better apologize to GISS for accusing them of something they didn’t do. But it’s still curious that no one uses the Louise Island record. It’s only one in the Antarctic Peninsula that goes back close to the turn of the century and as far as I can see there’s nothing wrong with it, except of course that it doesn’t show any warming. The trend prior to c. 1950 is irrelevant. This insight about whiter-than-white Antarctic snow with greater albedo than clouds, is fascinating and opens up many intriuging questions. – it has major nonlinear-chaotic pattern implications. The classic scenario identified by Alan Turing for biological pattern formation includes a simple model such as: one signal chemical promotes growth at short range, a second signal chemical inhibits growth at long range. Mix up their two effects and the result is emergent complexity. So a fat big Antarctica at the bottom of the world respnding in the opposite direction to global cloud-driven temperature trends could have profound influence on spatio-temporal climate and temperature patterns (but I have no idea what kind of influence). It could act to stabilise attractors in certain regimes. Its no coincidence that on those graphs of Louise Island, the 1940 region is the warmest…..which coincides with almost all of the temp records before they were adjusted. Its getting beyond a joke, all the evidence points to 1930 -1940 period as the warmest time in the record. thank you tallbloke. It is important these conmen are exposed, repeatedly. If they can use an island 3,300km from the South Pole for anomalies for the Antarctica then they can use Stockholm for the Arctic. I am VERY happy that the Talkshop has been reclassified OUT of the Transcendent Rant category. A good move for all concerned. Even the “peninsula” stations are mostly on K George Island in the S Shetland Islands, 100km off the coast of the actual Peninsula, and therefore out in the ocean currents. I’m missing information here. What happens now? When will this trend be corrected, if ever? Sadly I do not believe that is true. The earthquake scientist made it clear that there was a large level of uncertainty which media presentation lost in the transmission as far as I can see. Climate scientist have always maintained a spurious and unjustified certainty but are now so entrenched in the political machine there is no chance whatever of them being held accountable for the immense waste of money their predictions have caused. We still have not even got the fact that the data discrepancy between the new reference network and the old one is greater than any warming or even that there is a discrepancy. I am not sure if it has got as far as there being a comparison at all. No i believe they are safe as too many too powerful and rich people have too much to lose. It’s amazing the lucky coincidences the agw folks get. It turns out that in the same year they get the new stations in Antarctica the temperature on the mainland spikes 3C in that year. How coincidental because without that spike the record might look flat. It also is very convenient that Antarctica is such a large land mass that including such a spike at 1945 helps with that thorny problem of the decline in temperatures between 1945-1975. Placed right in the middle this helps a lot to lift those temps to give the nice smooth upward graph for worldwide temps that matches the models much better. Lucky thing that Antarctica decided to turn blast furnace on at 1945. SARCASM OFF.